With the coming of a new year, often we set new goals. One that I would like to inspire you to set is eating a healthy breakfast. Research shows that when we start our day with protein, rather than carbohydrates, it helps to maintain healthy blood sugar levels and aids in stopping the cravings. Typically a breakfast of cereal or toast means that you are getting fairly simple carbohydrates which break down quickly into sugar. This sugar will affect insulin production and consequently you will start on the highs and lows of blood sugar. In turn, this will cause you to want something sweet within a few hours of eating; hence the morning ‘donut’ break. This of course starts you on a cycle that can last the entire day! To avoid this, eat protein in the morning. Protein not only will stabilize those blood sugar levels but will actually aid in increasing your metabolism. A higher metabolism means you burn more calories! How can you go wrong? The recipe I am giving you is a fantastic way to get that protein and fill you up; satiating yourself for hours. Not only that but it is so FAST and EASY that you have no excuse! Once you try this, play around with a variety of combinations of vegetables (I’ll give you a few at the end of the recipe that I like). Turn on broiler. In a small sauté pan that can be put in the oven, melt butter over medium high heat. Meanwhile scramble eggs with milk, celtic salt and pepper. Mix the cheese into the eggs. Set aside. Place spinach in the pan with the melted butter, stir and cover until the spinach wilts. This will only take a minute or so. Once the spinach is wilted, add the egg mixture and immediately place under the broiler. Broil until the eggs are just starting to brown, about 2-3 minutes depending on your broiler. Remove and eat! Sauté minced shallot and shiitake mushrooms. This will take a few extra minutes to cook but worth the time! Sauté minced garlic and swiss chard. You can add some fresh rosemary if you have it. This is as fast as the spinach! Use whatever cheese you have in the house for a variety. 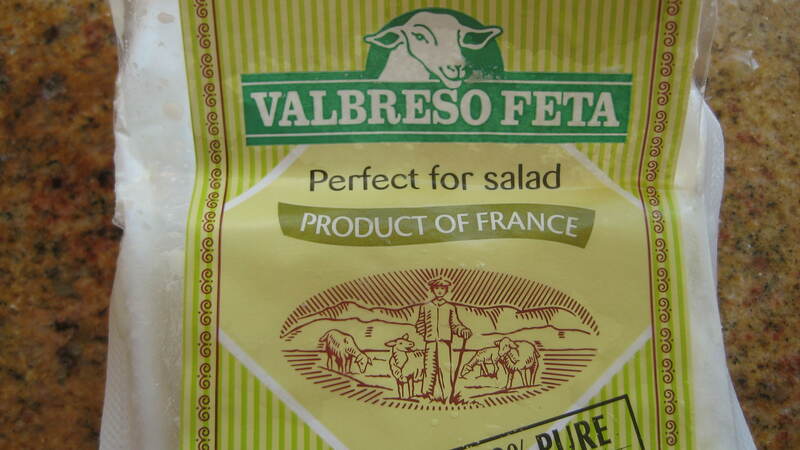 I especially like fresh grated parmesan. My long time friend Jeff Berman is a fantastic cook. Actually he and his wife Jan were the ones that inspired me to start exploring more gourmet cooking in the 80’s. Jeff’s dishes are always delicious, easy to make and nutritious. This dish is no exception. I made it for a picnic on Saturday and it was a big hit! In addition to Jeff being a creative cook, he is a creative guy when it comes to the home and gifts. He just launched a web-based store dedicated to interesting and affordable gifts for the home and travel. You might want to check out his store here! In a large sauce pan bring 1 ½ cups orange juice, garlic, shallot and thyme to a boil. Add the chicken and simmer covered for 10-12 minutes, until the chicken is cooked through. Remove chicken breasts. Reserve the liquid. In a separate sauce pan, bring 1 cup orange juice and the chicken broth to a boil. Remove from heat and add couscous. Cover and let stand 5 minutes. 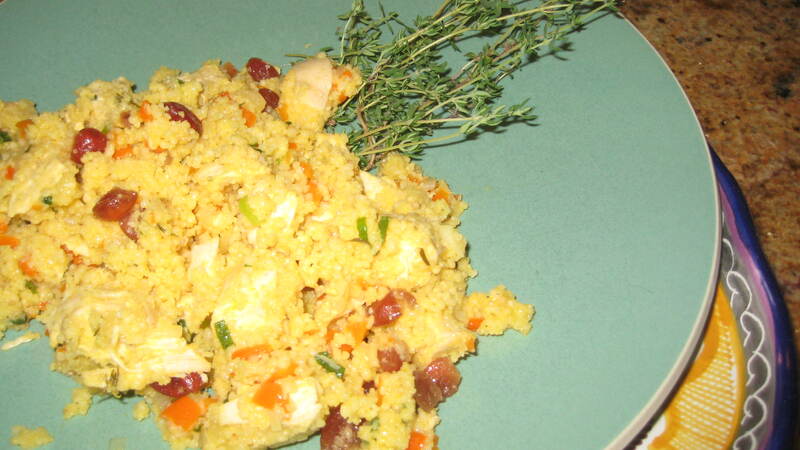 In a large bowl, fluff couscous with a fork and then add the green onion, cranberries and red bell pepper. Mix well. Cut cooked chicken into bite sized pieces and add to the couscous mixture. Meanwhile take the reserved liquid (from the chicken) and boil until reduced to half. Remove from heat and add the vinegar and olive oil. Toss into the chicken/couscous mixture. Add salt and pepper to taste. Serve at room temperature. Note: The couscous portion can be made a day ahead. The chicken is best if made the day you are serving. Jeff says fresh juice makes the dish much better than when using pasteurized. If you are lucky enough to get it fresh it is worth the extra cost. You could also try squeezing your own but that might take a lot longer. I used fresh as I have it growing in my garden. I used about 1+ TBSP. Is Your Farmer’s Market All Organic? I have been traveling a great deal to Pasadena, California to take care of my mother this year. She has been battling cancer which I am glad to report seems to be in remission! While I have been there I discovered there was a Farmer’s Market on Saturdays near where she lived. I was so delighted to find it since I am totally addicted to our Boulder Farmer’s Market and rarely miss a Saturday during season. I did notice when I went to the one in Pasadena that they had a big sign saying the produce was local but didn’t mention organic. Consequently I made note of which stands specifically mentioned organic or ‘not sprayed’ as in the case of one of the strawberry stands and purchased from them. It made me appreciate the Boulder market even more as I assumed it was totally organic. This week my friend Rowan Rozanski from Jay Hill Farm, where I buy all my greens every week, sent out an email on the entire organic subject. I was sad to learn that not all is as seems, even in our Boulder Farmer’s Market. I have asked her to share the following with you so as to better educate you about your local farmer’s market. I hope you find it as enlightening as I did! She is not the first person to ask this question. While the Boulder County Farmer’s Market, as my father and other early board members envisioned it, was to be an organic and local vendor’s dream, much of the dream has disappeared for the sake of plentiful vegetables and fruit. While still local, there’s very little focus on Certified Organic growers. Many of the new vendors over the last few years have in fact been the antithesis of what my family and I stand for. Please understand, this is not a rant about the market, it’s a problem of perception throughout many communities in America. Farm stands around the country have been known to prevaricate as well. “Family”, “Local”, “Home Grown” are all phrases that mean absolutely nothing. It is ILLEGAL to claim your produce is organic unless you are certified by the USDA and the state of Colorado or unless your yearly farm income is less than $5,000 a year. Many of the farms at BCFM are NOT organic. ASK! When you hear a sentence like “we don’t spray”, that means absolutely nothing. You don’t have to spray nitrogen, miracle grow, or any other substance to add it to the soil, ground water and produce. Once of my biggest gripes with the market was that you can only use “Organic” on your sign if you’re certified, but nothing says you have to say “not organic” Most people simply assume it’s all good, and go for the lower priced items that are not organic. This is unfair and harmful to those of us who are certified. Yes, our prices are higher, but there’s a reason for that! http://www.colorado.gov/cs/Satellite/Agriculture-Main/CDAG/1216022437979 (click on certified organic producers). Please understand that this rant is not to inveigle you into buying more produce from Jay Hill Farm. Buy wherever you want! It’s so that folks understand the difficulties faced by those of us who give our word to you and your families that we are doing our best to grow locally, sustainably, and with as much care for the earth and our fellow man as we can.